Versatile and stylish full view aluminum doors with a modern, industrial feel. Fiberglass or steel entry doors are energy efficient, low-maintenance and secure. Contemporary aluminum and glass garage doors seamlessly merge indoor and outdoor spaces. Raised panel and flush steel garage doors available in multiple insulation options. Beautiful wood garage doors available in limited edition, semi-custom and custom designs. 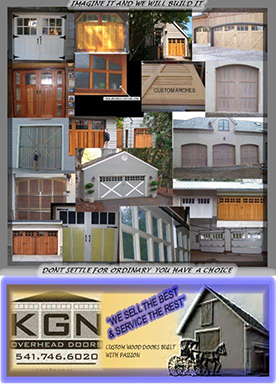 Look no further than KGN Overhead Door for Lane County's garage door experts. We have been providing quality products and services to the residents of Springfield and Eugene for nearly two decades, and would love to assist you with your garage door, entry door and opener needs. With more than 23 years of combined experience, you can be assured that our team of professionals will do whatever we can to meet your garage door needs in a courteous, timely and cost-effective manner. We service both the residential and commercial markets throughout Springfield and Eugene in Lane County, Oregon. Whether you're looking to purchase a new garage door or repair a broken torsion spring or panel, we're here to help. We also build beautiful custom wood sectional carriage-style doors. Please take a moment to browse our website and contact us for assistance. We look forward to hearing from you! Proudly serving all of Lane County, including Springfield & Eugene.